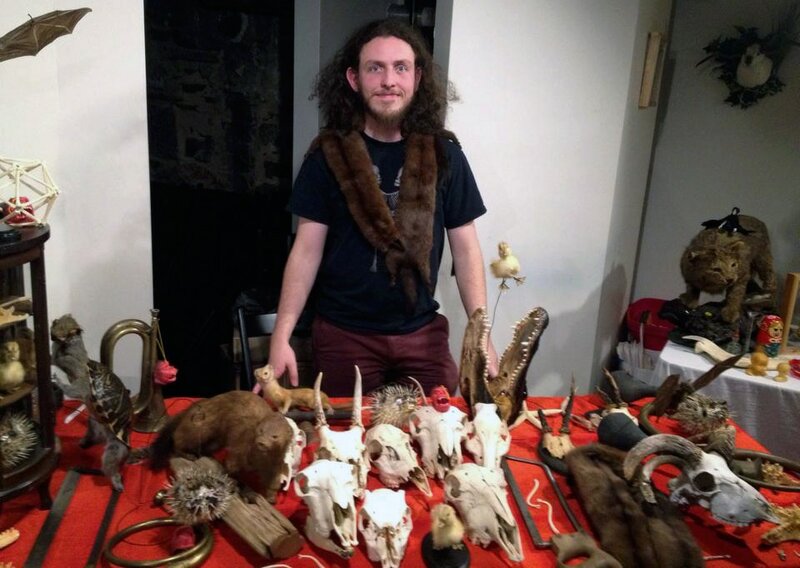 Wilder’s Living Room is a pop-up curiosity shop; Wunderkammer on the go; a curated collection of cool dead stuff. Physical objects are important oases of meaning in today’s digital world where smart phone, computer, and TV screens too often occupy the majority of our collective visual focus. I sell an assortment of natural history items and art objects centering around cabinets of curiosities. Taxidermy, skeletons & bones, sea life, fossils, jewelry, and antiques comprise the bulk of the display. At my table you’ll find regal ram, goat, and buck skulls, vintage Austrian fox, weasel, & badger taxidermy mounts, stunning butterfly wing jewelry, antique Bavarian roe deer antler plaques, chambered nautilus shells, articulated bat & cat skeletons under glass domes, 1920s postcards from my Swiss great grandmother, spiky blowfish, and fuzzy ducklings. 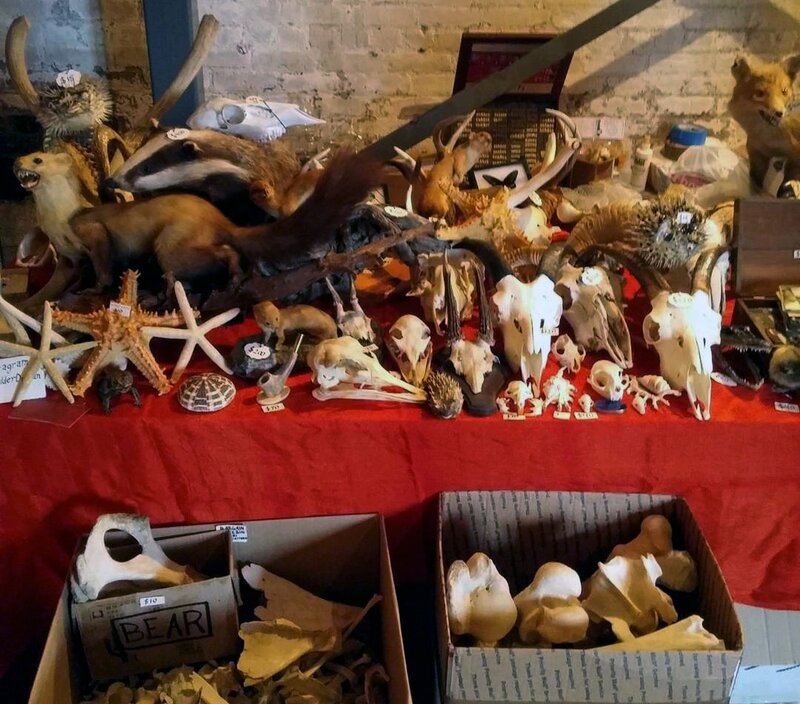 Don’t miss the bodacious bargain bone bin, which is full of affordable, professionally-cleaned deer, moose, & bear bones from carcasses found in the north woods of Maine! 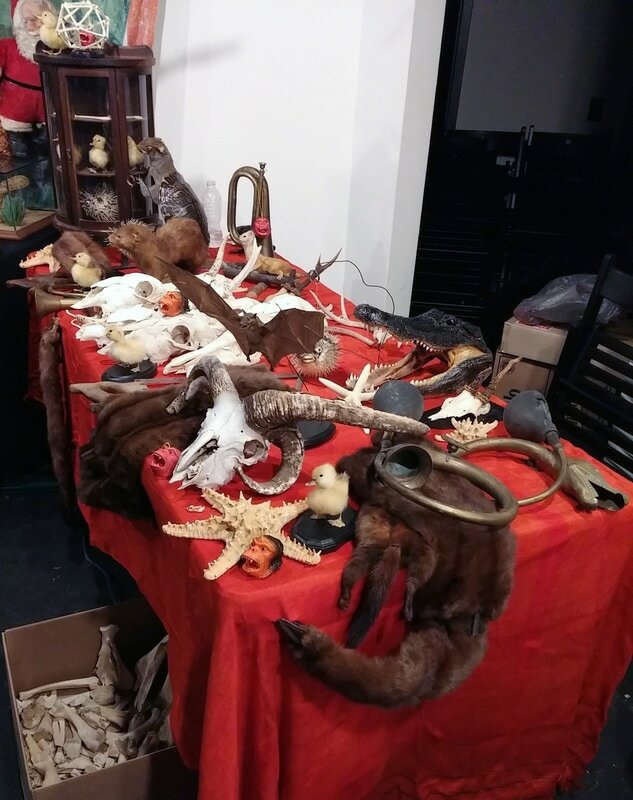 I sell an assortment of natural history items and art objects centering around cabinets of curiosities. 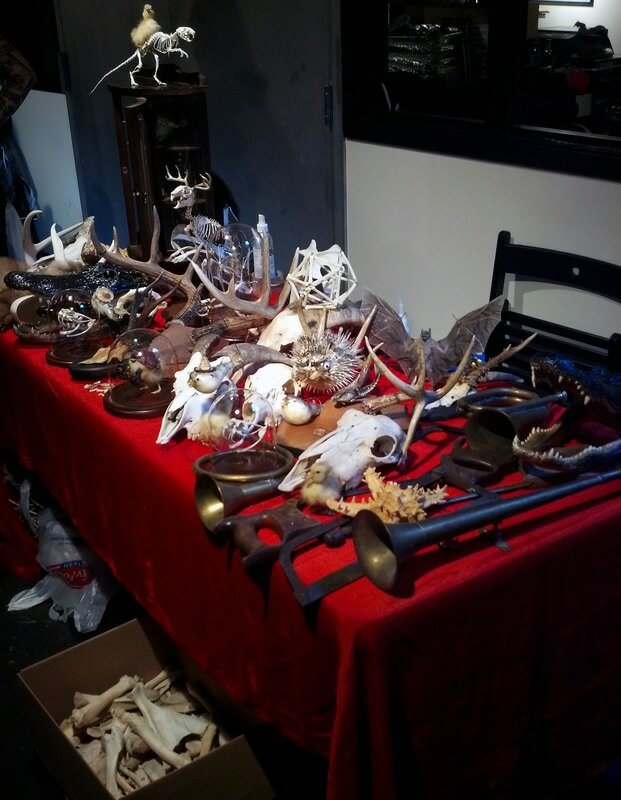 Taxidermy, skeletons & bones, sea life, fossils, jewelry, and antiques make up the bulk of the display. At my table you’ll find huge ram, goat, and buck skulls, vintage Austrian fox, weasel, & badger taxidermy mounts, stunning butterfly wing jewelry, antique Bavarian roe deer antler plaques, chambered nautilus shells, articulated bat & cat skeletons under glass domes, 1920s postcards from my Swiss great grandmother, spiky blowfish, and fuzzy ducklings. Don’t miss my bodacious bargain bone bin, which is full of affordable, professionally cleaned deer, moose, & bear bones from carcasses found in the north woods of Maine!